After a good three weeks, the rainbow finally submitted to the heavy rain and winds of this uniquely cruel Irish ‘summer’ and fallen. The fall has also broken it. I had thought to gather the team again (or another team) to carry out repairs – I welcomed the idea of the structure as something vulnerable that was in need of attention and care. However in the end I decided not to pursue this: aside from safety concerns, I was won over by a plea for ‘non revival and non permanence’. So the rainbow will most likely by rescued and removed… perhaps with something left in its place as a very, very modest monument. 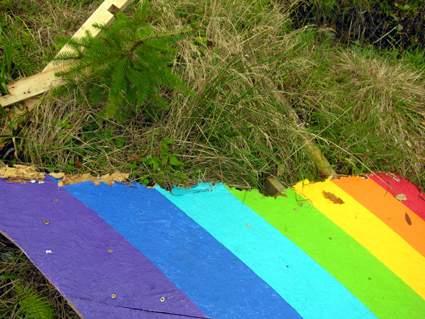 Sunday August 24th: seven volunteers, two child helpers and two dogs gather on a deforested site in North Co. Leitrim to errect a wooden rainbow; a roadside hoarding that advertises nothing. Where rainbows occur naturally and by chance, this event was planned and engineered in detail, and involved a good deal of physical work – drilling, sawing, hammering, lifting. 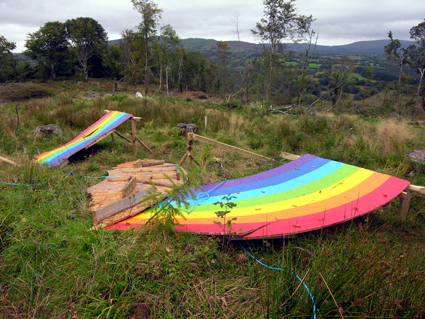 Part barn-raising, part folly, part idiosyncratic architecture, the rainbow is a sincere (if kitschy) expression of collective labour: huge thanks to Gordon, Craig, Bryonie, Anna, Ciara, Gareth, Peter, Ruth, Leander and Celia who made this possible. The rainbow is built near Lurganboy, and is visible leaving Manorhamilton on the Kinlough Road. It will remain until the end of October – if it doesn’t collapse first. This work is part of the New Sites, New Fields project at Leitrim Sculpture Centre that will open on October 4 2008. 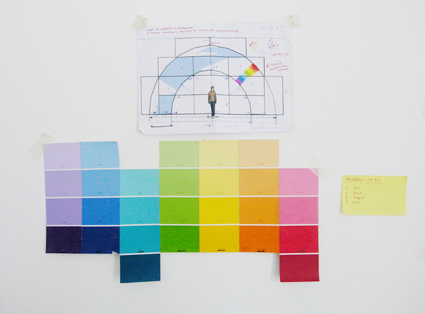 A super 8mm film has been shot to document the process of building the rainbow which will be screened later in 2008/9.